Crowther LJ, Brunner P, Ritaccio AL, Schalk G. Rapid Identification of Cortical Connectivity During Functional Mapping. American Epilepsy Society 72nd Annual Meeting. New Orleans, LA; 2018. Chen XY, Chen L, Yang X, Wang Y, Chen Y, Wolpaw J. Combining H-reflex conditioning and locomotor training appears to enhance locomotor recovery in rats with incomplete spinal cord injury: Initial results. Program No. 387.12. 2018 Neuroscience Meeting Planner. San Diego, CA: Society for Neuroscience. Online. 2018. Adamek M, Brunner P, Moheimanian L, Scherer R, Schalk G. Instantaneous voltage of electroencephalographic oscillatory activity: An alternative to power and phase measurements. Program No. 125.17. 2018 Neuroscience Meeting Planner. San Diego, CA: Society for Neuroscience. Online. San Diego, CA; 2018. Vaughan TM, Aslam M, Zoltan B, Brunner P, Norton JJ, Carmack CS, et al.. Creating an eyes-closed binary SSVEP-based brain-computer interface (BCI) for the bedside: A comparison of foveal centered and off-centered stimulus presentation. Program No. 225.17. 2018 Neuroscience Meeting Planner. San Diego, CA: Society for Neuroscience. Online. San Diego, CA; 2018. Vaughan TM, Aslam M, Zoltan B, Brunner P, Norton JJ, Carmack CS, et al.. Creating an eyes-closed binary SSVEP-based brain-computer interface (BCI) for the bedside: A comparison of foveal centered and off-centered stimulus presentation. 2018. Norton J, Eftekhar A, Heckman S, Barnes JH, McCane L, Wolpaw J. Towards operant conditioning of the flexor carpi radialis: Methods and initial results. Program No. 387.08. 2018 Neuroscience Meeting Planner. San Diego, CA: Society for Neuroscience. Online. 2018. Adamek M, Brunner P, Moheimanian L, Scherer R, Schalk G. Instantaneous voltage of electroencephalographic oscillatory activity: An alternative to power and phase measurements. Program No. 125.17. 2018 Neuroscience Meeting Planner. San Diego, CA: Society for Neuroscience. Online. 2018. Schalk G. Perspectives on Brain–Computer Interfaces. In Brain–Computer Interfaces Handbook. CRC Press; 2018. pp. 721–724. Gunduz A, Schalk G. 16 ECoG-Based BCIs. In Brain–Computer Interfaces Handbook: Technological and Theoretical Advances. 2018. p. 297. Brunner P, Schalk G. 17 BCI Software. In Brain–Computer Interfaces Handbook: Technological and Theoretical Advances. 2018. p. 323. Contralesional Brain-Computer Interface Control of a Powered Exoskeleton for Motor Recovery in Chronic Stroke Survivors. Spinal transection alters external urethral sphincter activity during spontaneous voiding in freely-moving rats. Spatiotemporal dynamics of word retrieval in speech production revealed by cortical high-frequency band activity. EEG Error Prediction as a Solution for Combining the Advantages of Retrieval Practice and Errorless Learning. Use of phase-locking value in sensorimotor rhythm-based brain-computer interface: zero-phase coupling and effects of spatial filters. Nothing either good or bad but action makes it so. Prediction of subjective ratings of emotional pictures by EEG features. How neuroscience can inform the study of individual differences in cognitive abilities. Evaluation of multidimensional models of WAIS-IV subtest performance. A method to establish the spatiotemporal evolution of task-related cortical activity from electrocorticographic signals in single trials. The inferior olive is essential for long-term maintenance of a simple motor skill. Spatio-Temporal Progression of Cortical Activity Related to Continuous Overt and Covert Speech Production in a Reading Task. Proceedings of the Eighth International Workshop on Advances in Electrocorticography. Word pair classification during imagined speech using direct brain recordings. Electrocorticographic mapping of expressive language function without requiring the patient to speak: A report of three cases. Intraoperative mapping of expressive language cortex using passive real-time electrocorticography. Ablation of the inferior olive prevents H-reflex down-conditioning in rats. Oscillatory phase modulates the timing of neuronal activations and resulting behavior. Alpha power indexes task-related networks on large and small scales: A multimodal ECoG study in humans and a non-human primate. Modeling General and Specific Abilities: Evaluation of Bifactor Models for the WJ-III. The newly established National Center for Adaptive Neurotechnologies, which is supported by the National Institute of Biomedical Imaging and Bioengineering, is the culmination of a unique research program that has developed at the Wadsworth Center over several decades. This program is founded on two major advances, one scientific and one technical. The scientific advance is the recognition that activity-dependent plasticity occurs continually throughout the central nervous system (CNS) and throughout life. The technical advance is the widespread availability of hardware and software that can support complex real-time interactions with the nervous system. The scientists and engineers of the Center have both contributed to and taken advantage of these advances; and they have built a unique technical and procedural infrastructure that supports beneficial real-time interactions with the CNS. They are using this infrastructure to produce important new scientific insights and novel therapeutic methods. 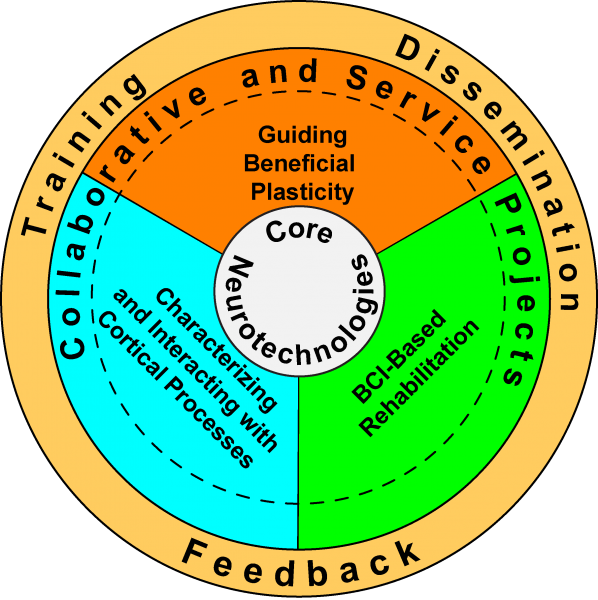 They are realizing adaptive systems that interact with the nervous system in real time to achieve three important goals: guiding beneficial CNS plasticity; restoring lost neuromuscular functions; and characterizing and localizing brain processes both spatially and temporally. These three goals and the adaptive systems dedicated to them are the foci of the Center’s three technical research and development (TR&D) projects. These projects use a suite of related hardware/software platforms and real-time analysis methods that are continually updated and expanded. Through energetic interactions with a set of outstanding collaborators, Center personnel are developing and using each project as a basic research tool and are also translating it into important new clinical applications. The Center is thereby increasing understanding of CNS function and dysfunction; and it is realizing effective new therapies for a wide range of devastating neurological disorders. In addition, The Center provides an extensive program of training and dissemination activities and resources. The goal of this program is to create and maintain an ecosystem of people, knowledge, and hardware and software that enables and promotes the widespread use and further development of adaptive technologies by scientists, engineers, and clinicians to address important scientific and clinical problems. This program includes training courses and workshops, presentations at meetings and institutions, internships and other opportunities to work with Center scientists and engineers, software and hardware resources, training manuals, technical support mechanisms, opportunities for user interactions, and promotion of uniform hardware/software standards. The National Center for Adaptive Neurotechnologies is part of Health Research Inc., a not-for profit corporation organized under the New York State not-for-profit Corporation Law. It is exempt under Section 501(c) (3) of the Internal Revenue Service Code.